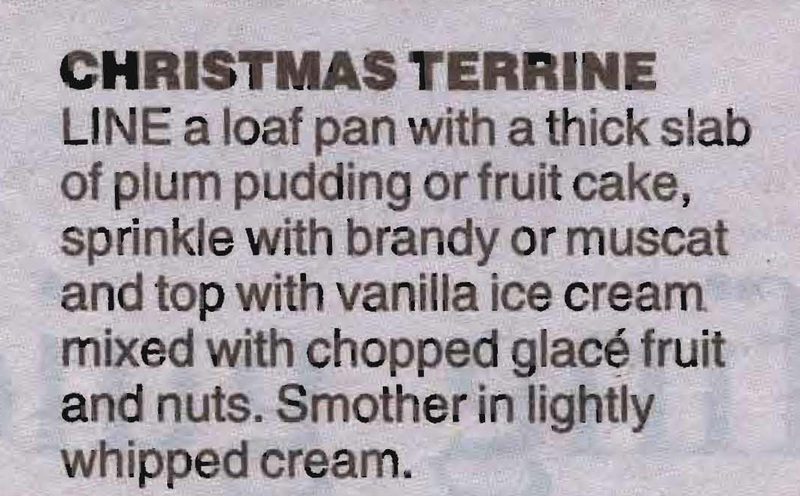 This cutting from the Herald Sun Checkout cooking page says ‘any old trifle is dead easy, but a “great” trifle has mystique’. A trifle overdone perhaps, but a good trifle is a great summer dessert. 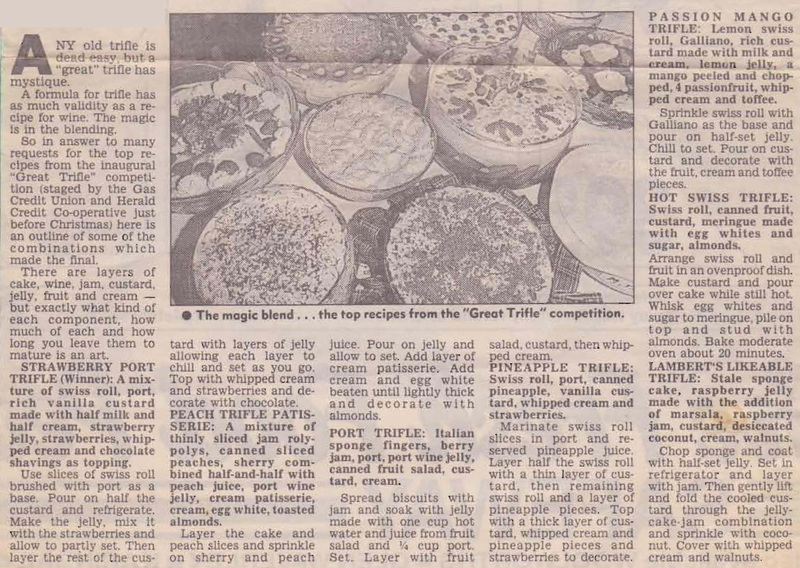 These versions seem to have come from the inaugural ‘Great Trifle’ competition – unsurprisingly not a competition that’s around anymore. 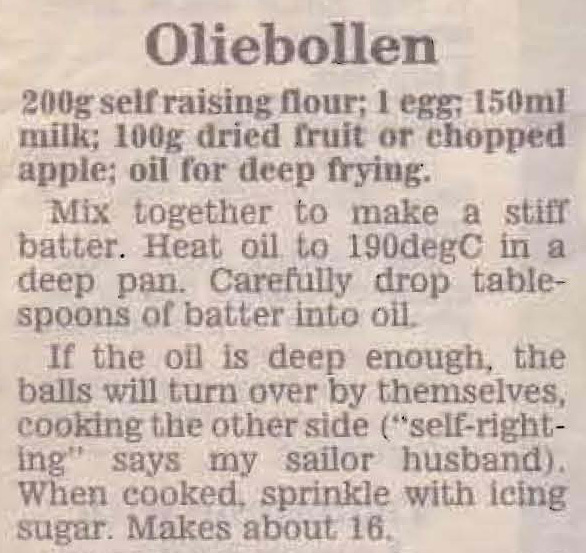 Equally I’m not quite sure of how these recipes would work today, but there’s some interesting combinations in them!!!!! This time of year when you have to take a ‘plate’ to all sorts of Christmas functions White Christmas is another quick and easy copha recipe that can work quite well. It was something that Mum made every Christmas, put on a plate with a bit of tinsel or some sprigs of holly it looks really festive. It might be a bit old fashioned now, but it still tastes great. These are a couple of versions I found in Mum’s collection. Fruitcakes are essentially easy to make once the fruit is prepared. You can tell this is an old recipe as it has an ingredient not heard of today – Parisienne Essence. Parisienne essence has nothing to do with Paris or even French cooking it was a flavouring used to darken dishes and was used in gravies, fruitcakes and puddings. 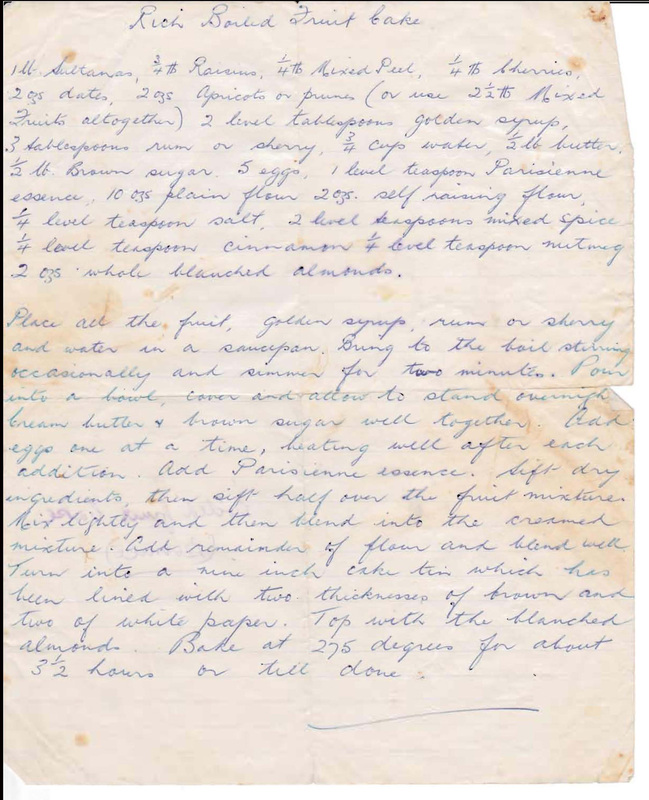 Leaving it out of this recipe won’t affect the finished cake as there are plenty of other ingredients to give it a good flavour. Place all the fruit, golden syrup, rum or sherry and water in a saucepan. Bring to the boil stirring occasionally and simmer for two minutes. 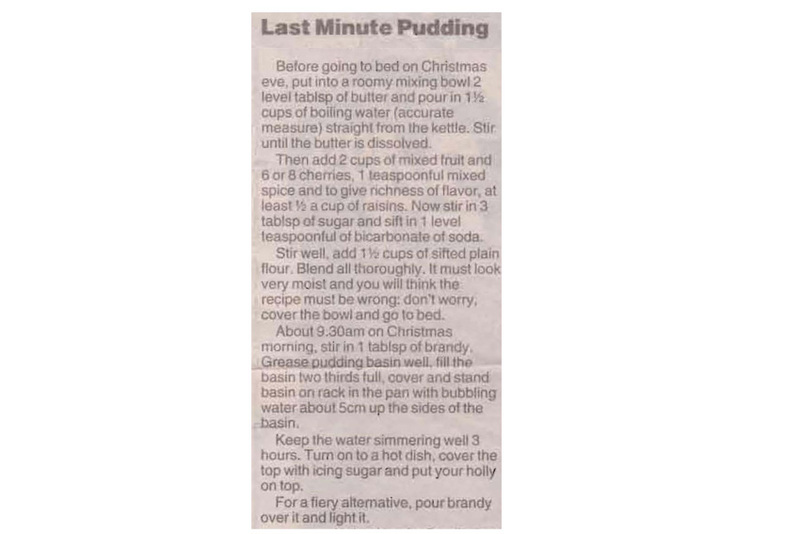 Pour into a bowl, cover and allow to stand overnight. Cream butter and brown sugar well together. Add eggs one at a time, beating well after each addition. Sift dry ingredients, then sift half over the fruit mixture. Mix lightly and then blend into the creamed mixture. Add remainder of flour and blend well. Turn into a 22cm cake tin which has been lined with brown paper and with baking paper (the original recipe says 2 layers of brown and 2 of white, while that might be a bit much you shouldn’t skimp on the paper as the cake cooks slowly and the paper stops it drying out). Top with blanched almonds. Bake at 140°C for 3½ hours or till done. Mum’s sisters all worked in dressmaking before they married, but Mum, just to be different, worked in a bookbinding business. 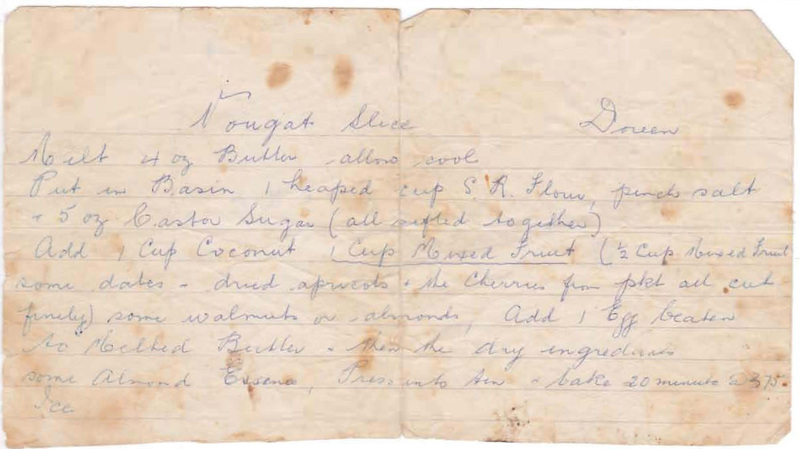 Doreen was one of her friends there so I think this recipe originates from the 1940s. It’s obviously before packet mixed fruit, which is a much easier alternative now. The addition of dates and apricots would add a bit of extra flavour though. Melt the butter and put aside to cool. Sift flour, salt and sugar together and put in a basin, add coconut, mixed fruit & nuts. Add beaten egg to melted butter and then mix into dry ingredients with some almond essence. Press into slice tin and bake 20 mins at 190°C. Ice when cold (you could use vanilla or chocolate icing and sprinkle with coconut, if desired).